PICTURED ABOVE: Stephen Norcup (left) and Carmelo R. Montalvo (right) attending the Pittsburgh Technology Council's Tech 50 Awards reception. PITTSBURGH - (October 16, 2017) This year, Forest Devices, Inc. was named a "Start-Up of the Year" finalist for the PTC Tech 50, alongside Angler Labs, Ariel Precision Medicine, ForAll Secure, PECA Labs, Skycision, and Small Change. 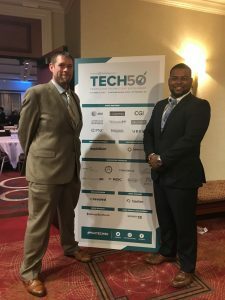 Although the winning nod ultimately went to Skycision, we here at Forest Devices appreciate the opportunity and awareness brought by being a finalist at Pittsburgh Technology Council's Tech 50. Congratulations to Skycision as well as all other finalists.